The ‘Hotel Artemis’ premiere on Saturday (May 19) in Westwood, California was a monochromatic affair with many celebrities favoring black and white. Sofia Boutella: The cloud-like ethereal beauty of the skirt in her Giambattista Valli Fall 2017 Haute Couture look was contrasted with the inky sparkle of the bodice. The black shoes help tie everything in, as does the black underskirt which is just visible from this angle. Jenny Slate: The funny lady graced the red carpet in a romantic Rebecca Vallance gown. Some might get a bridal sentiment from the look, but her styling helped downplay the notion. Jodie Foster: The actress looked chic in Altuzarra Pre-Fall 2018. The fit is sleek and sharp while the patterned shoes add a playful finish. They were also a sensible option as she needed the assistance of crutches following a ski accident. 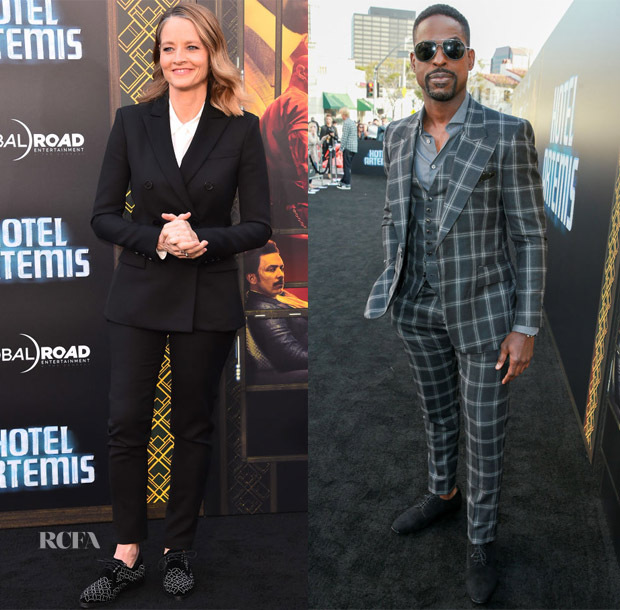 Sterling K Brown: Making a statement in bold checks, the ‘This Is Us’ actor was dressed in a Musika Frere suit, Jimmy Choo shoes and Mont Blanc watch. The open neckline and shades add a cool suave to the more formal style.